Wannstedt was born in Baldwin, Pennsylvania and attended Baldwin High School. He earned an athletic scholarship to the University of Pittsburgh playing offensive tackle and blocking for future Heisman Trophy winner Tony Dorsett. After a successful career with the Panthers, he was chosen in the fifteenth round of the 1974 NFL draft by the Green Bay Packers, but spent his only NFL season on the injured reserve list with a neck injury. In 1975, Pitt coach Johnny Majors hired him as a graduate assistant coach. He was on the staff when the Panthers won the 1976 NCAA Division I-A national football championship with a victory over the Georgia Bulldogs in the 1977 Sugar Bowl. In 1977, Jimmy Johnson joined the staff of the Pitt Panthers and the two would forge a long lasting personal and professional bond. When Johnson left to become the head coach of the Oklahoma State Cowboys in 1979, he invited Wannstedt to join his staff. Wannstedt served as defensive line coach for the Oklahoma State Cowboys for the 1979 and 1980 seasons and was promoted to defensive coordinator in 1981, a spot he held for two seasons. He moved on to University of Southern California in 1983 to coach the Trojans and served as the defensive line coach for three years. In 1986, Wannstedt became defensive coordinator for the Miami Hurricanes under friend and mentor Jimmy Johnson, where they won a national championship in 1987. When Johnson was hired as head coach of the Dallas Cowboys in 1989, Wannstedt joined Dallas' staff as defensive coordinator. The Cowboys defense was considered one of the best in the NFL under Wannstedt's leadership and he became a prime candidate to become an NFL head coach. When Chuck Noll retired as head coach of the Pittsburgh Steelers, in 1992, Wannstedt was one of the finalists for the job, but was ultimately edged out by fellow Pittsburgh-area native Bill Cowher. On January 19, 1993, he was hired as the head coach of the Chicago Bears replacing legendary coach Mike Ditka, another former Pitt Panther. Wannstedt's tenure at Chicago was tumultuous. He led the Bears to only one postseason appearance in his 6 years at Chicago and compiled a 41-57 record. After Wannstedt posted back-to-back 4–12 seasons and a 1-11 overall record against long-time rival, the Green Bay Packers, Bears owner Michael McCaskey fired Wannstedt on December 28, 1998, a day when five NFL head coaches – one sixth of the league – lost their jobs. Four of those coaches—Wannstedt, Ted Marchibroda, Ray Rhodes, and Dom Capers—were fired within one hour, while Dennis Erickson was fired later that day. In 1999, Wannstedt again joined coach Jimmy Johnson's staff—this time, as defensive coordinator and assistant head coach of the Miami Dolphins. When the then-56-year-old Johnson announced his retirement suddenly on January 16, 2000, Wannstedt was the obvious choice to replace him, and he was immediately named Johnson's successor. Under Wannstedt, the Dolphins regular season record was 42-31, with playoff appearances in his first two seasons. 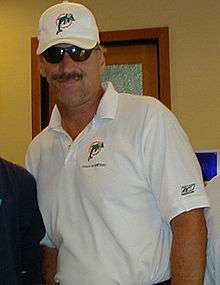 Wannstedt resigned as head coach midway through the 2004 season, with the Dolphins record standing at 1-8. Less than two months later, he agreed to return home to fill the head coach vacancy at his alma mater, the University of Pittsburgh. When University of Pittsburgh head coach Walt Harris was forced to resign, Wannstedt, with NFL experience and a proven college recruiting record, immediately became a candidate to replace him. As a Pittsburgh area native, former Pitt player (offensive tackle from 1971–73), Pitt graduate (B.S. in 1974; M.Ed. in 1976), and previous graduate assistant coach at the university under Johnny Majors and Jackie Sherrill (1975–78), Wannstedt had strong ties to both the university and the city. Wannstedt was initially interested in the job but pulled back over salary issues and concerns about his ability to keep a quality staff. After working out several issues with the Pitt athletic department including pay raises for assistant coaches, Wannstedt agreed to Pitt's offer and was named head coach on December 23, 2004. Wannstedt said that recruiting would be a top priority under his leadership. Harris had been roundly criticized during his tenure for not recruiting top high school talent, especially in the crucial and talent-laden western Pennsylvania area. Wannstedt retained some of Harris' staff including Paul Rhoads, the defensive coordinator, but made several key changes including bringing in former Baltimore Ravens offensive coordinator Matt Cavanaugh to run his offense. Cavanaugh was Pitt's starting quarterback in 1976 and 1977 when Wannstedt was a graduate assistant coach. In his first season, Wannstedt inherited a Pitt team that won a share of the Big East Championship and played in the Fiesta Bowl the previous year under Harris, and was ranked 21 in the first AP Poll of 2005. However, defeats by Notre Dame and Ohio University; and a last second loss (by a score of 7-6) to Nebraska kicked off a disappointing 5-6 season that also saw Pitt get humiliated 45-13 by arch rival West Virginia. This campaign was Pitt's first losing record since 1999. Wannstedt's recruiting prowess led Scout.com analysts to rate the Panthers' class of 2006 the eleventh best in the country. Wannstedt followed his touted 2006 class by bringing in the #8 recruiting class in 2007. The class included blue-chip players such as RB LeSean McCoy, QB Pat Bostick, and OG Chris Jacobson. On December 1, 2007, just days before an upset win at West Virginia, Wannstedt was given a contract extension through 2012; he had previously been signed through 2009. The 13-9 upset win in the annual Backyard Brawl denied the Mountaineers a chance to play in the BCS National Championship Game and was the start of a turnaround that subsequently lifted Coach Wannstedt and the Panthers to a 9-4 season in 2008. The Panthers started the 2008 season ranked in the top 25 for the first time under Wannstedt's leadership (although the Panthers were ranked #25 in the pre-season before Wannstedt's first game in 2005). Starting 0-1, Pitt soon defeated Buffalo and then beat Iowa with a 21–20 victory. On Thursday, October 2, 2008, the Panthers scored an upset win over the then-ranked and undefeated #10 University of South Florida in a game nationally televised by ESPN. Then on Saturday, October 18, 2008, the Panthers easily defeated Navy. Upset by Rutgers, however, Pitt rebounded with a 36-33 overtime victory the following week at Notre Dame. The game, which lasted four overtime periods, was the longest game ever for both Notre Dame and Pittsburgh. After a 41–7 rout of visiting Louisville, the Panthers improved to 7–2 and were bowl-bound for the first time under Wannstedt. A loss to eventual Big East champion Cincinnati Bearcats eliminated the Panthers from BCS contention. However, Coach Wannstedt stayed upbeat, and worked with defensive coordinator Phil Bennett to devise a gameplan to defeat West Virginia for the 2nd time in four years in the annual Backyard Brawl. Pitt defeated West Virginia 19-15 on the day after Thanksgiving in a national telecast on ABC. The following week the Panthers won at UConn to improve to 9-3 on the season and clinch a bid to the Sun Bowl. Dave Wannstedt improved his record at Pitt to 25-22. On December 31, 2008, Pittsburgh was defeated in the Sun Bowl by Oregon State 3-0 in a defensive struggle. The Oregon State team that defeated USC in 2008 had remarkably shut out the Pitt Panthers for only the first time in twelve years. 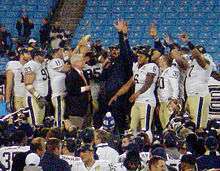 In 2009, Wannstedt led Pitt to a 3-0 start before losing on the road to North Carolina State in the fourth quarter. Wannstedt's Panthers then won their next 6 games, raising Pitt's record to 9-1 and the team cracked the Top 10 in the rankings, their best mark since the Dan Marino led team in 1982. The Panthers faltered in their final two games, however, losing to both West Virginia 19-16 and Cincinnati 45-44 in the Big East Championship game to fall to 9-3. After the regular season, Pitt went on to defeat the North Carolina Tar Heels in the Meineke Car Care Bowl to finish the season with 10 wins for the first time since 1981. On March 30, 2010, Wannstedt received a two-year contract extension through the 2014 season. On December 7, 2010, Wannstedt resigned as head coach, reportedly under pressure following a disappointing 7-5 regular season and having failed to advance to a BCS bowl during his tenure. With his resignation, Wannstedt was offered a position as special assistant to the athletic director at the university. He did not coach the 2011 BBVA Compass Bowl. On January 21, 2011, it was announced that Wannstedt was joining the Bills staff as Assistant Head Coach/Linebackers Coach under Chan Gailey, who served as Wannstedt's offensive coordinator in Miami in 2000 and 2001. He was promoted to defensive coordinator on January 2, 2012. He was dismissed, along with the entire Bills coaching staff, on December 31, 2012. Wannstedt was hired as the Tampa Bay Buccaneers special teams coach on February 1, 2013. In being hired by the Buccaneers, he was joining the staff of Greg Schiano, who was an assistant under Wannstedt when he was the head coach of the Chicago Bears during the mid-to-late 90s. The special teams coaching job with the Buccaneers is the first special teams coaching job Wannstedt has taken during his NFL coaching career, although he did manage special teams while head coach at the University of Pittsburgh. He was let go by the Buccaneers at the end of the 2013 season. 9 7 0 .563 4th in NFC Central 1 1 .500 Lost to San Francisco 49ers in NFC Divisional Game. 11 5 0 .688 1st in AFC East 1 1 .500 Lost to Oakland Raiders in AFC Divisional Game. 11 5 0 .688 2nd in AFC East 0 1 .000 Lost to Baltimore Ravens in AFC Wild Card Game. ^A Wannstedt resigned before Pittsburgh's 2010 bowl game. ↑ "Wannstedt Announces Resignation From Pitt" (Press release). University of Pittsburgh. 2010-12-07. Retrieved 2010-12-16. ↑ Bennett, Brian (2010-03-30). "Pittsburgh Panthers coach Dave Wannstedt has contract extended". ESPN.com. Retrieved 2010-03-30. 1 2 Associated Press (2010-12-07). "Dave Wannstedt resigns at Pitt". ESPN.com. Retrieved 2010-12-16. ↑ "Dave Wannstedt named Buffalo Bills assistant head coach". Foxsports.com. Retrieved 2011-11-23. ↑ Gaughan, Mark (31 December 2012). "Bills make it official: Gailey is fired". The Buffalo News. Retrieved 31 December 2012. ↑ "Dave Wannstedt Record, Statistics, and Category Ranks". Pro-Football-Reference.com. Retrieved 2012-08-16.